I have a rather large 'bag for life' size paper bag full of snacks. It sits there in the spare room, taunting me that I'll never manage to eat it all in time. As most of it is chocolate based it is right. I'm not that fussed about chocolate. I must have 5kg of the stuff in various forms. Sometimes I go in the bag and find things that are close enough to chocolate that I've forgotten about them. Case in point is this Mont Blanc Chocolate Dessert Pocky. I'm not sure who got me this, or when it was, but I felt I'd done too many recent Pocky reviews so squirrelled it for another day. That day is today! I'm pretty sure Pocky isn't the traditional Sunday Lunch but when reviews need to be written this is what occurs. I've not really heard of Mont Blanc Chocolate - presuming it to be some kind of posh version and that this would be a milk and white mix. This is incorrect - the flavour is a light coffee one. This confused me somewhat, but as I do like I nice cup of coffee (usually Decaf these days) it was a pleasant shock. I'd say that this is pretty close to the columbian blends I favour too, it's a smooth flavour and only has a merest hint of the bitter aftertaste of most coffee flavoured things. The taste does really linger - which worried me for the upcoming Thursday review that I'd taint my palate for that most special of Pocky which I've rediscovered in the snack bag. There are another 9 sticks of this left, and I'll probably take it in to work with me as is the fate for most post review snacks that I didn't finish. This one however will stay in my drawer and get eaten on afternoons where a little luxurious kick is needed to make it to 5pm and beyond. 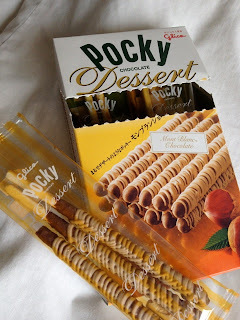 Ive never tried Pocky before but these look pretty good, would like to try some some time yum! Ha - there is a nut on the box too. Maybe I'll have to adjust my senses, but I could have sworn it was similar to coffee. Maybe it was a psychological thing as I have two packs of Coffee Pocky style things to try nearby. Will have to try the real cake though, that sounds all kinds of ace.